Whether you've noticed a headlight on your Subaru has gone out, or it's been awhile since you had all your exterior lights checked, now is a great time to save at Carter Subaru Shoreline. Right now in our parts department, show this coupon and you'll save 20% off the price of headlights, taillights, or marker light bulbs. The lights throughout the exterior of your Subaru are important for your safety, so grab this coupon and come see us today for 20% off the exterior lights you need at Carter Subaru Shoreline. No other vehicle is engineered quite like a Subaru, and that means it's important to only trust genuine parts like the factory intended. These are exactly what you'll find in our well-stocked parts department at Carter Subaru Shoreline, and we frequently update parts and accessory special offers like this one to help you save even more. Additional details on what you can expect are available in our Genuine Subaru Parts Information pages, and see how you can get even more from your Subaru with genuine performance parts. 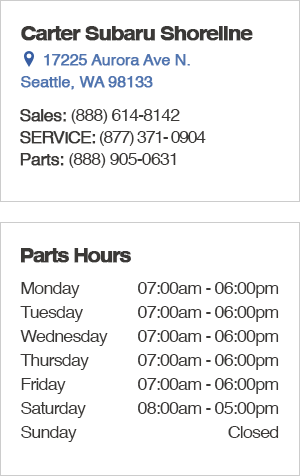 Stop by our location at 17225 Aurora Ave N., Seattle, WA 98133 to get your Subaru parts, or you can order them online. We look forward to meeting you at Carter Subaru Shoreline where we proudly serve Lynnwood and Mountlake Terrace, WA.